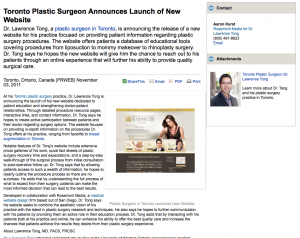 Dr. Lawrence Tong, a plastic surgeon in Toronto, is announcing the release of a new website for his practice focused on providing patient information regarding plastic surgery procedures. The website offers patients a database of educational tools covering procedures from liposuction to mommy makeover to rhinoplasty surgery. Dr. Tong says he hopes the new website will give him the chance to reach out to his patients through an online experience that will further his ability to provide quality surgical care. At his Toronto plastic surgery practice, Dr. Lawrence Tong is announcing the launch of his new website dedicated to patient education and strengthening doctor-patient relationships. Through detailed procedure resource pages, interactive links, and contact information, Dr. Tong says he hopes to create active participation between patients and their doctor regarding surgery options. The website focuses on providing in-depth information on the procedures Dr. Tong offers at his practice, ranging from facelift to breast augmentation in Toronto. Notable features of Dr. Tong’s website include extensive photo galleries of his work, quick fact sheets of plastic surgery recovery time and expectations, and a step-by-step walk-through of the surgical process from initial consultation to post-operative follow up. Dr. Tong says that by allowing patients access to such a wealth of information, he hopes to clearly outline the procedure process so there are no surprises. He adds that by understanding the full process of what to expect from their surgery, patients can make the most informed decision that can lead to the best results. Developed in collaboration with Rosemont Media, a medical website design firm based out of San Diego, Dr. Tong says his website seeks to combine the aesthetic vision of his practice with the latest in plastic surgery research and techniques. He also says he hopes to further communication with his patients by providing them an active role in their education process. Dr. Tong adds that by interacting with his patients both at his practice and online, he can enhance his ability to offer the best quality care and increase the chances that patients achieve the results they desire from their plastic surgery experience. Dr. Lawrence Tong attended undergraduate studies at the University of Western Ontario and earned his medical degree from the Medical School at the University of Toronto. He further pursued his qualification in Plastic and Reconstructive Surgery at the University of Michigan Medical Center in Ann Arbor during a seven-year training program. Dr. Tong is board-certified in Plastic Surgery by the American Board of Plastic Surgery and the Royal College of Physicians and Surgeons of Canada. He is also a member of the American Society of Plastic Surgeons and the American Society of Aesthetic Plastic Surgery. Located at 199 Avenue Road in Toronto, Ontario, Canada, Dr. Tong’s practice can be reached at (416) 972-0999. He can also be contacted online via the website myplasticsurgerytoronto.com.